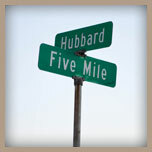 Our Livonia office is conveniently located at the corner of Five Mile Road and Hubbard. Ample parking is available in our parking lot off of Hubbard Road. Our parking lot is shared with an adjacent building. Feel free to park in any available designated parking spot.